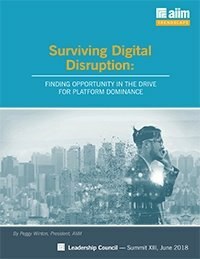 Finding opportunity in the drive for platform dominance. Digital Transformation is not just about doing things differently, but about doing different things. As users view their businesses in new ways, and as disrupters in all sorts of unexpected places introduce new transformative business models, how does this change the way organizations view their technology needs, and consume content capabilities? What vendor competencies and capabilities will be key as user organizations create their platform plays and new information ecosystems? These are the questions posed to AIIM’s Leadership Council members at think tank sessions held in London and Baltimore in June, 2018. Download the FREE TRENDSCAPE to gain the insights and recommendations from the Leadership Council discussions.